My new Big Bear Mountain Bike and Hiking site is online now! It has pictures, trail maps, 3d trail views, downloadable GPS tracks and more! Scroll down for my 1990's era text trail descriptions trail guide! Winter riding Big Bear Lake in light snow! Park at Bear Valley Bikes ( 40298 Big Bear Blvd. ). After about 4 miles 2N10 intersects 2N86. You should find the Castle Rock Trailhead heading North from this point. From here I recommend returning the way you came. The trail continues North to Highway 18 but becomes extremely steep and technical. Only Expert riders should attempt to ride down to Highway 18. To get to the trailhead find Mill Creek Road which intersects Highway 18 across the street from Bear Valley Bikes on the South side of Big Bear Lake. Continue up Mill Creek Rd (2N10) which turns to dirt after one mile. After 4.5 miles you will take a right on 2N11 and continue 1 mile to the Champion Lodgepole Trailhead parking lot on the right side of the road. From here it is a short 1/4 mile hike or bike to the largest Lodgepole Pine in the world! This trail is also a self guided nature walk. Trail Guides are sometimes available at the trailhead and always available at the Discovery Center. The Bluff Mesa Trail starts at the Champion Lodgepole Pine. It goes North .4 miles to the Bluff Mesa Group Camp. No Bicycles allowed on the Bluff Mesa Trail. A self guided nature walk. The Woodland trail parking lot is 1 mile East of the Discovery Center on Highway 38 on the North Side of Big Bear Lake. Trail Guide Brochures are available at the Discovery Center. I recommend hiking this trail with kids and saving the bikes for the Pedal Path. Park at the Gray's Peak Trailhead off 38 between the damn and Fawnskin. The trail starts with some steep climbing and flattens out to a gradual incline after 1/2 mile. Crank up until you get to a fireroad next to yellow post campsite number 1 and take a right staying to the right at the junction with 2N04X until you see a Gray's Peak Trail sign on the right. From here the trail becomes very secluded and is unbroken until you reach Gray's Peak. Enjoy the view and the descent. When you hit the fireroad go right and then stay left and pick up the trail back to the parking lot. (NOTE: if you go left 100 yards on the fireroad you can pick up the sweet 4 mile rolling singletrack to Hanna Flats campground (water available) Return the way you came. The Cougar Crest Trail starts 1/2 mile west of the Discovery Center on HWY. 38. If you park at the discovery center you do not need an Adventure Pass, but note what time the parking lot closes so you don't get your car locked in overnight. This also adds 1/2 mile of paved trail in each direction. The Cougar Crest Trail winds up the hillside offering spectacular views of the lake and ski resorts on the opposite mountainside. The trail ends at the junction of the 2600 mile long Pacific Crest Trail (PCT) which runs from Mexico to Canada. Just North of this junction on the PCT you will find a fireroad that takes you to Bertha Peak. Here you will find radio towers and great views in every direction. Return the way you came. From The Big Bear Hostel ( 527 Knickerbocker Rd. ) in the Village ride up Knickerbocker Rd. Just as the road starts to turn you will see fireroad 2N08 on your left. This is a tough 4 mile climb all the way to Grandview Point. (2 miles climbing, 2 miles relatively flat) On your way to Grandview Point you will pass Towne Trail to Snow Summit on your left, 2N51Y on your left, cross Pine Knot Trail (1E01) and 2N17 on your right and arrive at Grandview Junction. Take the short .25 mile climb to Grandview Point and enjoy the view and some food and drink. You are about to enjoy the best singletrack descent in the area all the way down to Mill Creek Road Picnic Area. During your descent on Pine Knot Trail (1E01) you will go straight across 2N10 and 2N08. When you get to the picnic area take a right on Mill Creek Road, then a right on Highway 18. Go straight through the village and you will hit Knickerbocker Rd. Go left and you will be back at the Adventure Hostel. Drive East on Highway 38 towards Redlands. Just past State/Mitchell Ln. take the first right and park near the end of the pavement. Ride up 2N93 fireroad or take the narrower more fun 2N93A trail. 2N93A will end in a clearing with a stump in the middle of it. Take the singletrack that starts just to the right of the barbed wire fence. This will take you back to 2N93. Go left for more climbing and great views or go down the way you came or on 2N93 back to your car. The Alpine Pedal Path is a multi-use (Walking, biking, skating, strollers, wheelchairs) trail which runs from the Discovery Center on Highway 38 on the North side of Big Bear Lake to the intersection of Highway 38 and Stansfield Cutoff Rd. It is 2.5 miles of meandering blacktop trail that follows the shoreline and passes through forest and meadows. The trail has aged a bit and you will find big cracks where the asphalt is uneven causing small bumps every 20-30 feet. The trail also passes by the Serrano Campground. Parking is available at either end of the trail. For an extended bike ride I recommend parking at the Mill Creek picnic area and riding all the way to the Champion Lodgepole and back. 9 miles total. The Bluff Mesa Trail continues from the Champion Lodgepole Pine. Park at Snow Summit Mountain Resort and purchase lift ticket for you and your bike. After a scenic 15 minute chair ride through the forest you will be at the Snow Summit Viewhaus at the top of the mountain next to forest service road 2N10 (Skyline drive). Take the trail .75 miles to 2N10, take a right and head West 3 miles to the Grandview Point Junction. From here you can ride .25 miles to Grandview Point where you will find a great view of San Gorgonio and out towards San Bernardino. When you come back down from the point look for the signs marking the Grandview Loop. You should be heading North on 2N08. (Note: Just across 2N10 where you come out from Grandview Point is the top of the Pine Knot Trail (1E01). You can take the first 2 miles of this fun singletrack trail which will take you parallel to 2N08, through Deer Group Camp, and pop you out on 2N08 near the 2N11 Junction. Go right on 2N08 here and continue on the Grandview Loop Trail.) Heading down 2N08 from Grandview Point you will come to the intersection with 2N11 to the left. Go right to continue on 2N08. 30 feet ahead on the left you will cross Pine Knot Trail (1E01). (Taking 1E01 down from here will take you to Mill Creek Road Picnic Area far from Snow Summit. You will have to ride back on Highway 18 / Big Bear Blvd. 3 miles to Snow Summit) Continue 2N08 for 1.75 miles of mostly flat riding through the forest until you junction with 2N51Y. Stay left and continue down 2N08 for about 1.5 miles of mostly downhill. At a sharp-wide left turn in 2N08 you will see signs for the Towne Trail to Snow Summit. The trail starts between two big boulders and is a fun wide singletrack 2 miles back to Snow Summit. Climb up either 2N08 from Knickerbocker Rd. or 2N10 to 2N17 from Mill Creek Rd. At the junction of 2N08 and 2N17 go down 2N17 for about .5 mile and look for a singletrack on the right. Take this steep singletrack down to a small plateau overlooking the lake. Go left on the singletrack and enjoy 2-3 miles of winding singletrack. After about a mile the trail makes a U turn to the right and you go back heading east. If you miss this turn you will come out in a residential neighborhood, go back and find the trail. The trail ends at a small stream crossing, sometimes dry, go left on another trail and you will come out at the Mill Creek Picnic area. Park at Snow Summit and take the Chairlift to the top of the hill. Follow the signs for 2N10 West. After 4 miles of roller coaster fireroad on 2N10 you will arrive at Grandview Junction ( 2N10 & 2N08 & 1E01 ). Continue straight on 2N10 and after 1.7 miles look for an unmarked singletrack on the right ( North) side through a meadow. As a landmark, on the south side of 2N10 you should find Clarks Grade 1N54. Take Plantation down for almost 1 mile of great singletrack. Plantation ends at a yellow post campsite. Continue down the fireroad leading to the campsite until you hit 2N10 again. Go right on 2N10 and in 3/4 mile take a left on 2N17. Climb up 2N17 until it ends at 2N08. Go east on 2N08 for 2 3/4 miles, halfway down stay left at a junction with 2N51Y . When you see Towne Trail on the right, take this nice singletrack all the way back to Snow Summit. From the top of Snow Summit take 2N10 East. Look for tire tracks up the left side of the embankment. This is the entrance to Pirates. Stay on this trail and it will dump you back onto 2N10. Go right to do it again, or continue down 2N10 for .6 miles and take a left on an unmarked junction. This will take you to Lower Fall Line trail on the right, marked by a big flat rock. From here on stay left and Lower Fall like will turn into Bristlecone Trail and then end on Bristlecone Rd. Go left on this gravel road back to Snow Summit. This singletrack trail connects Hanna Flats Campground off of fireroad 3N14 to Grout Bay Picnic / Gray's Peak area parking lots. Grout Bay Loop: Park in Fawnskin or Grout Bay Parking area on Highway 38. From Fawnskin, ride 3 miles up 3N14 to the Hanna Flats Campground.Go straight toward the back of the campground and find a trail marked by 2 red painted rocks next to the road and a plastic trail marker. The trail goes uphill and curves to the right around a hill behind the campsites. Its about 4 miles of rolling singletrack through the forest over rocks, ruts, roots, and usually dry creeks. The trail crosses a fireroad many times but is well marked. (When in doubt stay left and look for trail markers!) The Hanna Flats trail ends at a fireroad - you will see a sign stating 4 miles to Hanna Flats Campground - take a left and stay left on this fireroad for 1/4 mile and you will pass the trail up to Gray's Peak on the right. (Note: you can add about 4 miles total of nice singletrack climbing and a super fun descent by taking this out and back trail up to Gray's Peak) Keep staying left and you pick up the trail to Gray's Peak Trailhead parking lot and Grout Bay Picnic Area. Go left on highway 38 to return to Fawnskin. I prefer to maximize singletrack and trail riding and stay off the roads by parking at the Gray's Peak Trailhead off 38 between the damn and Fawnskin and riding up the trail, stay right on fireroad, ride to Hanna Flats, get water at campground, eat, turn around ride the fun singletrack back to the Gray's Peak trail, ride up to Gray's Peak, try to see the lake through the trees, enjoy 3 mile singletrack descent to your car at the Gray's Peak Trailhead. This trail is part of many longer rides but it is a nice trail to warm up on and avoid riding Big Bear Blvd. The trail begins behind the condos at Snow Summit and continues through the forest to intersect with 2N08 1/4 mile above Knickerbocker Rd. Advanced - about 11 miles of fireroad and jeep trail. Park on Van Dusen Canyon Rd. where the pavement ends and ride up 3.5 miles into Holcomb Valley. Take a left on 3N16. Take the third right on 3N07. After about 1 mile take a left on 3N43. After awhile you will come to a clearing and find a trail marked, "The John Bull Trail - 3N10". Its about 3 miles of sometimes technical jeep trail from here and you will come to 3N32. Take a right which leads you back to 3N16. Take another right and in 1 mile you will be back to Van Dusen Canyon Rd. Go left back to your car. the corner of Big Bear Blvd. and Knickerbocker Rd. 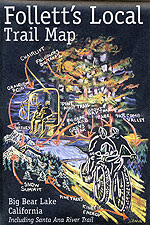 These rides are loosely described here and you must have a detailed trail map of the area. From the Adventure Hostel at 527 Knickerbocker take Big Bear Blvd. to Stansfield Cutoff. Cross the lake and go right on North Shore drive. Climb up Van Dusen Canyon fireroad 3N09. Take a left in Holcomb Valley on 3N16. Take a left on 3N12 and ride over Delamar Mountain. Take a right on 3N14 and go to the Hanna Flats campground. In the back of the campground find the Grout Bay singletrack trail. Take this to Gray's Peak then ride down to Highway 38 and continue around the lake to where you started. From anywhere in Big Bear Valley get on your bike and ride the roads to the east side of Baldwin Lake. Take 2N02 east for about 15 miles over a couple of hills and you find yourself in a valley full of big Joshua Trees. Ride through the sand for about 1 mile and you will see huge red piles of dirt along the road. These are the tailing piles from the mine. Wander up a steep rocky road to the east and you will find the mine shaft in the middle of the side of the mountain. Bring a flashlight. (NOTE: Mineshafts are dangerous, don't go in them.) Ride back the way you came. These trail descriptions are as accurate as possible. Use these descriptions for planning only! Always take food, water, tools, tubes, first aid, cell phone, defribulator, and a detailed map when you ride Big Bear area trails. 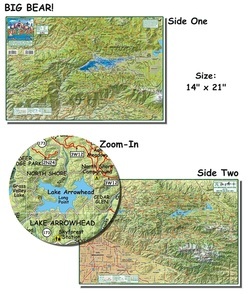 Maps are available at the Big Bear Discovery Center or Bear Valley Bikes. Please let us know of any inaccuracies or new trails. 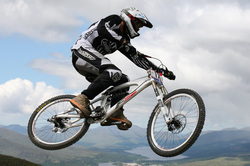 Owned and operated by Mountain Bike Riders and Mountain Bike Racers. Available at local shops or click above to order online.